NOTE: One of our readers, Karen Whitaker, contacted us with this story about her cat Sasha, and has graciously (and courageously) given us permission to post it. Thank you so much, Karen, for telling your story, and helping people understand the devastating consequences of declawing. 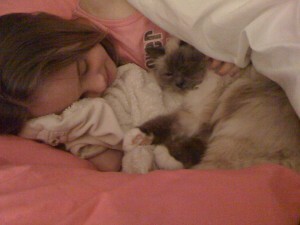 This kitty probably isn’t the image anyone has of animal cruelty. I however am as guilty as any other perpetrator, although it was not my intent. After our precious kitten destroyed a substantial amount of furniture and exhausting every anti scratching methodology I came across, we looked into having him declawed. This was my first pet and I talked to several people including our vet about the surgery. Everyone I talked to, who had declawed a kitty, reported a few days of “down time” followed by a hasty recovery and no long term incident. 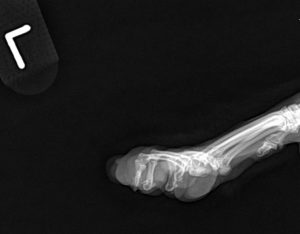 Radiograph of the right paw, showing the abnormal bone position due to declawing, and how the tips of those bones are driving directly into the paw pads underneath. We had the kitty declawed and really weren’t aware of a great deal of pain because he had to stay at the vets for several nights following surgery. Recently he stopped eating and that was our only indication of pain. He still played and slept and loved us as he always had. Evidently, unlike dogs, cats are rarely demonstrative of pain. To make a long story short, we had major issue. Not because the surgery was botched, because of the imbalance or weight shift that occurs when you amputate the last digit of your kitty’s finger. In our case, the longest digit on each paw reacted to the weight shift or trauma from now being walked on, by generating more bone. That bone actually grew through the pads of his front paws. If it sounds extremely uncomfortable, you are in agreement with every veterinarian I consulted with, in this case 5. Again, the only signal we had was loss of appetite for a period of about 5 months. We had to amputate that bone on both paws up to the next joint. This time I insisted upon being with the cat overnight after surgery and I can now tell you exactly why a vet will not send your cat home with you the night after a declaw. It’s torture. That’s it and that’s all. Radiograph showing the abnormal positioning of the declawed toes on the left paw. Declawing a cat is banned in most countries outside of of North America and within the U.S. I think there are about 8 cities that have banned it as well. Today I went back to the vet to have a new radiograph of his paws and it appears that another digit may need to be amputated as it too is pushing through the pad. I’m guessing that we don’t hear about all the cats that have trouble following a declaw because their owners have no way of knowing the cat is in pain or they are embarrassed as I am that they put their cat through something that is actually quite inhumane. My hope is declawing will be banned in all U.S. cities so that people really won’t have the option of making a bad decision. I’m disgusted with myself for the selfish decision I made just to protect my “stuff”. And that, my friend is what I think of in regard to animal cruelty. I know there is so much more, but amputating digits to make an animal more convenient is just as bad as starving them. Maybe worse. Declawing is legally banned in 8 cities in California: West Hollywood, San Francisco, Berkeley, Los Angeles, Santa Monica, Culver City, Beverly Hills, and Burbank. 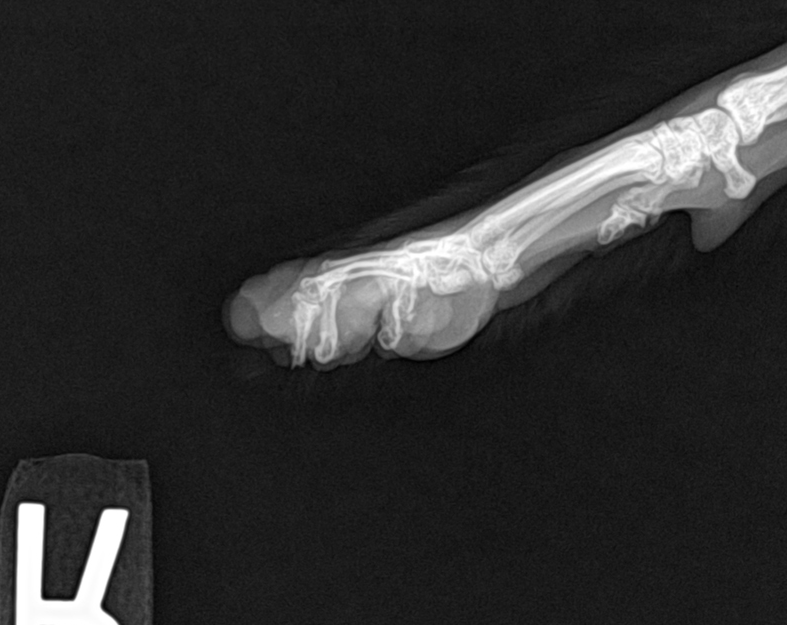 While having the bone actually grow through the paw pad is unusual (several veterinarians have reported the same condition on the Veterinary Information Network), it is absolutely normal for the severed tendons to contract after declawing, thereby pulling the second toe bone (P2) into a more vertical position (see illustration to the right). This is a normal and expected result from declawing, because amputation of the last toe bone (P3 and claw) changes the physical forces acting on the paw. Amputating that bone eliminates the weight-bearing and protective function of the last toe bone (P3). In many cats, this actually changes the shape of the paw pads as well; they become smaller and rounder as the body tries to cushion the direct vertical forces from P2. Click here for more information, including x-rays and photos, of how these inevitable alterations take place. These changes are painful for the cat, and practically guarantee the eventual development of arthritis.